First impressions were typical — as would happen again elsewhere later the same day, I parked in front of the studio without realizing that I’d parked in front of the studio. 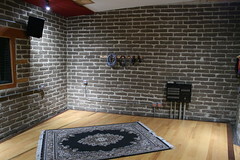 Recording studios are nearly always unmarked; they don’t do walk-in business. Passersby don’t need to know that millions of dollars’ worth of gear is housed inside. But at Electrical, I experienced more strongly than usual the contrast between the utilitarian exterior and the studio inside, in which every inch of space, every angle of wall, every corner treatment and surface covering and ceiling slope had been carefully, even meticulously planned. 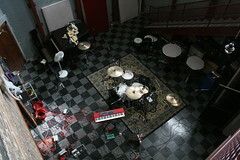 We began in Studio B, set up by engineer/producer John Congleton to record a band called Red Knife Lottery. For a “B” room, it’s nicer than most “A” rooms; the main live area has a 30' ceiling with windows set high on the wall, giving the space an airy yet industrial vibe — the outside walls are brick, and a metal staircase and catwalk wrap around the room. The catwalk provides cool aerial views of the setup below. 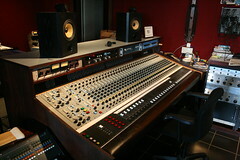 Upstairs is the B control room, with a Neotek console that I’m told used to be Mr. Albini’s home-studio console. 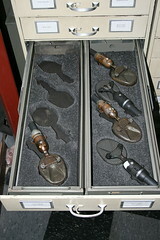 Below the staircase is the studio’s microphone collection. Most of the mics are stored in a series of metal cabinets, sorted more-or-less alphabetically into long, shallow drawers, each of which contains foam that’s been die-cut to fit whatever microphones belong there. I suppose this was done to provide rattle-free storage, but it also provides a quick visual method for checking after a session if all the mics have made it home. The mic collection is just astounding. I mean, it would be. But to see it up close is something else altogether. E.g., eight Coles 4038. The magnetic field was strong enough to reset my watch. (Well, not really, but I wouldn’t have trusted a nearby compass.) Another drawer, empty besides the foam, had room for eight Josephson e22S — one in use just behind me, and the other seven were presumably with Mr. Albini in Wales. Standing just above the kick drum was a Neumann U-48 in Cardioid mode, close enough to pick up the both the resonance and the stick impact of all the drums. Overheads were Royer R-121s, low above the cymbals and parallel to the floor. Just inside a hole cut in the front kick head was an RE-20, and 10' away — but curiously behind the kit — was an Altec 150 omni that I assume was wired for room sound. There may have been more room mics lurking in corners. So, that was three tube condensers, two FET condensers, a large dynamic, and a pair of ribbons, with a total cost of approximately $18,000… not including preamps and console. 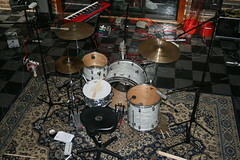 Yeah, I’m looking forward to hearing those drums tracks! 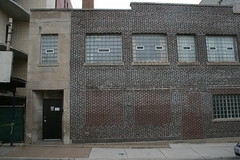 Next to the live room was a “dead room,” set up with Red Knife Lottery’s bass cab and, if I recall correctly, guitar cabs. I neglected to take good pictures there but I did notice a Beyerdynamic M-380 on the bass cab. Next, we walked through Studio A, a complex of three tracking rooms and a large control room, all with nice sightlines to each other. The main live room is huge, e.g., most bassists I know would get lost in there. The EA website specs it at 1200 square feet. Terry Bozzio’s drum kit would fit comfortably in a corner. However, Bozzio’s kit, or mine for that matter, would more likely end up next door in the Kentucky Room, which appears to have been built more or less specifically for drum tracking. 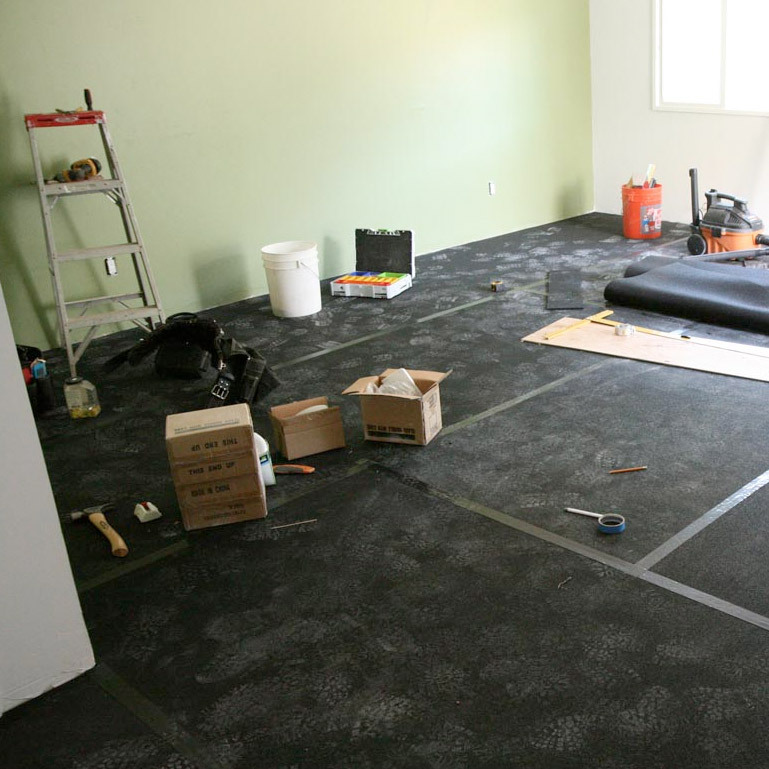 The construction details of this room are amazing; check out the schematic. As I understand it, it’s a 20-foot tall space with floating floor suspended on joists about 9' above the bottom. Opposing walls are not parallel; nor is the ceiling parallel to the floor. The four walls are made of exposed adobe brick, reportedly because it both absorbs sound well (isolating the various spaces) and because the reflected sound is more pleasing than what is produced by smooth finishes. The space sounds live, even bright. I’d very much like to visit during a tracking session here. Stepping next into the room, called Alcatraz, provided such an acoustical contrast that I stopped in my tracks, and in mid-sentence. The room is disarmingly dead. Did I just lose my voice? No, but it got stuck in the walls. 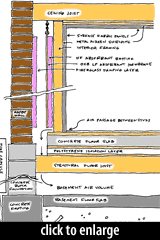 Of course, there is another cool construction schematic . This room takes absorption to another level. This has as little in common with, say, tacking carpet scraps to the ceiling as, say, that Altec 175 has with an SM57. Well, except that the SM57 actually works, whereas the only thing you’ll achieve by nailing old carpet to the ceiling is ensuring that the entire band will need a bath after every rehearsal due to the constant rain of dirt, dust, pet hair, cigarette ash, mite excrement, etc. As effective as the broadband absorption is, the way in which it was achieved is astonishing. There are no visible bass traps, nor blocks of “wedges” or other acoustical foam. The magic is behind the fabric-covered panels on the walls. 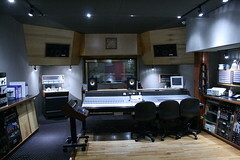 Our last stop was the Studio A control room. Big console, natch. Soffit-mounted monitors, natch. Racks of outboard gear, natch. Custom-made, house-branded mid-side decoder with glowing Electrical Audio logo that changes color every five seconds… ’nuff said. I left Electrical with the sense that I’d glimpsed something mythical. I’ve seen some nice studios before, but never anything like this — so deliberately considered, so beautifully executed. Awesome. Click the little picture to the right to see the full set of photos from Electrical Audio. Great article! 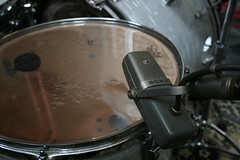 A small correction though – the mike on the floor tom is a Sony C-38 (Japan market) or C-37FET (North American market) from about 1965. The C-38B, also a FET condenser, had a different windscreen design and slightly modified electronics. Kevin, thanks for the clarification. I’ve updated the post to show the correct Sony mic name.